This decision is precisely how my dearest and I landed at Pudong Airport on the morning of 25 December instead of waking up in Stockholm as we usually do during the end-of-year holidays. For 2017, we instead found agreeably priced flights to Shanghai and booked four nights there before continuing on to Macau and our beloved Hong Kong. The Bund, on the Huangpu River's western bank, is where you'll catch the quintessential Shanghai view of skyscrapers across the water on Lujiazui peninsula. This gif below, created by photographer Carlos Barria, demonstrates the incredible development of Shanghai's Pudong financial district between 1987 and 2013. The city's population ballooned right alongside, rising from 12 million people in 1982 to 24 million by 2016. 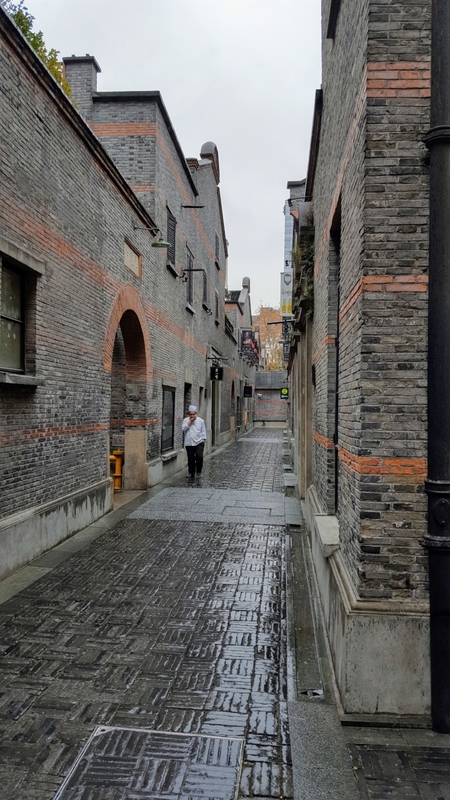 If you tire of looking at the modern world, simply turn your back to the river for a glimpse of Shanghai's diverse and grandiose past along the Bund. 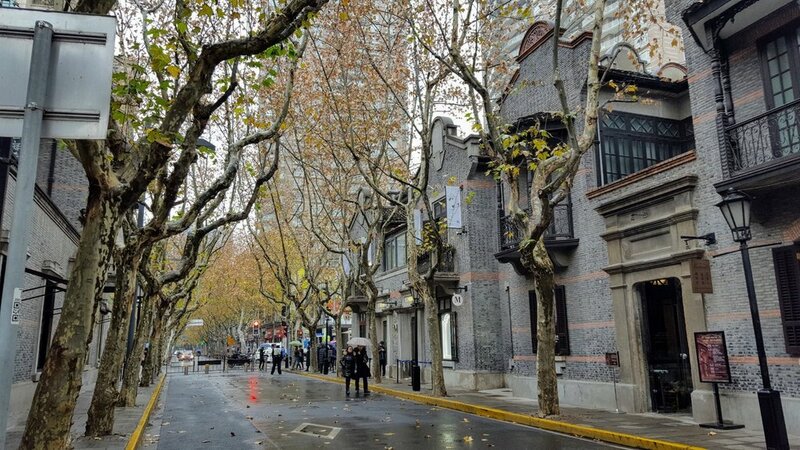 This section of Zhongshan Road was part of the former International Settlement, as is evidenced by the European-style buildings. Shanghai is often referred to as the "Paris of the East," in no small part due to its longstanding French settlement from 1849 until 1943. 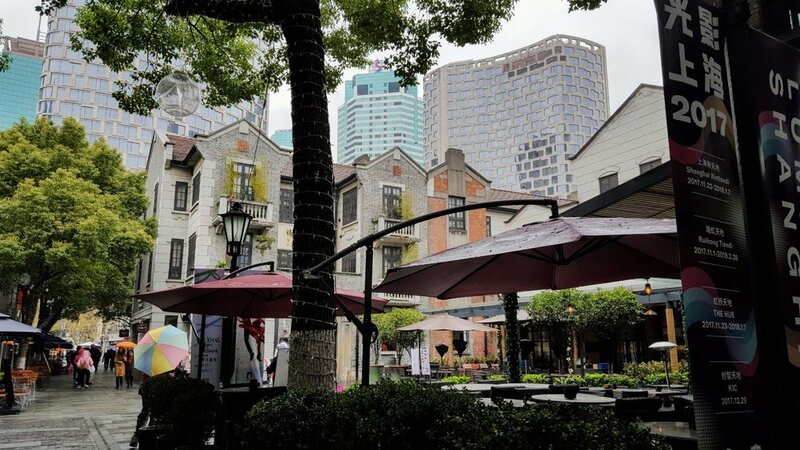 Located in today's districts of Xuhui and Luwan, the streets of the former French Concession retain their European charm with shady, tree-lined avenues, art deco buildings, and a smattering of international restaurants, food purveyors, and boutique shops. The area is popular with expats, tourists, creatives, and anyone seeking a quiet moment in the midst of a busy city. 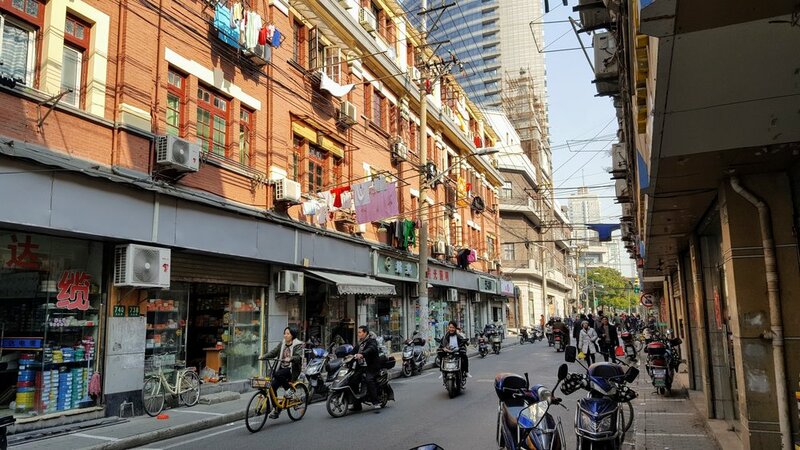 Next, let's head over to Shanghai's [understandably] tourist-laden Old City. 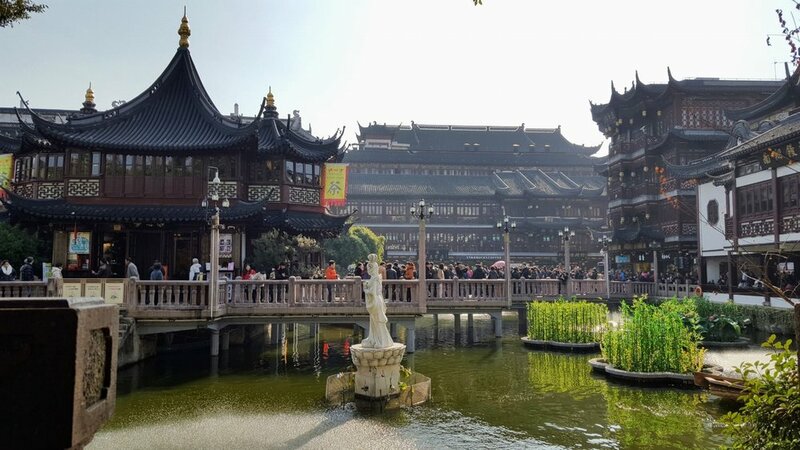 This is where you'll find the beautiful Yu Gardens, City God Temple, the bustling Old Town Bazaar, and countless narrow alleyways filled with vendors hawking their wares, which range from antiques to street food to mass-produced souvenirs. The Old City is a must-see for sure, but was not where I wished to spend an abundance of time due to the crowds and the incessant sell-sell-sell energy. Unfortunately, I didn't take many photos in this area either as we were in a bit of a stupor from our mutually sleepless flight over, and had already been walking around for a couple of hours by the time we found ourselves in the Old City on our first day. From the Old City we switch gears entirely, moving over to the...dare I say...capitalist haven that is Nanjing Road. 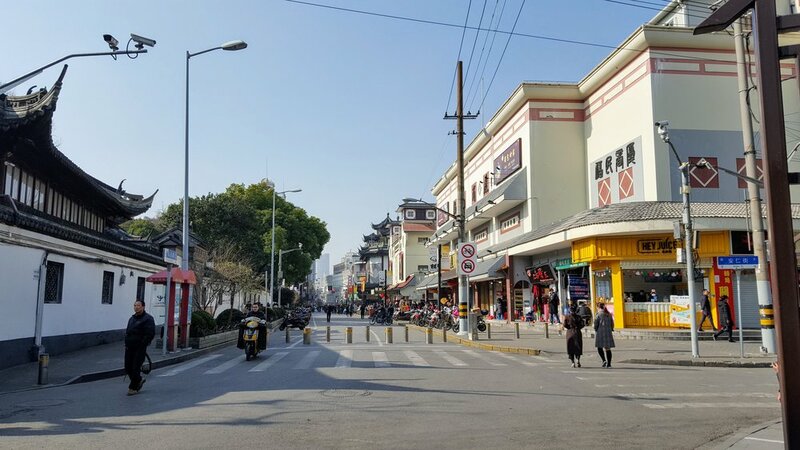 Nanjing is Shanghai's main shopping street and is subsequently lined with malls, historic department stores, and recognizable storefronts aplenty. Name a popular brand and you'll probably find it here. While we had limited interest in the shopping opportunities, J and I both loved the visual feast of signage, which is especially a treat at night. "...but surely you didn't just look at all those tall buildings and not go up in one, right?" You might be asking, growing weary of scrolling through this endless post. And you'd be right. 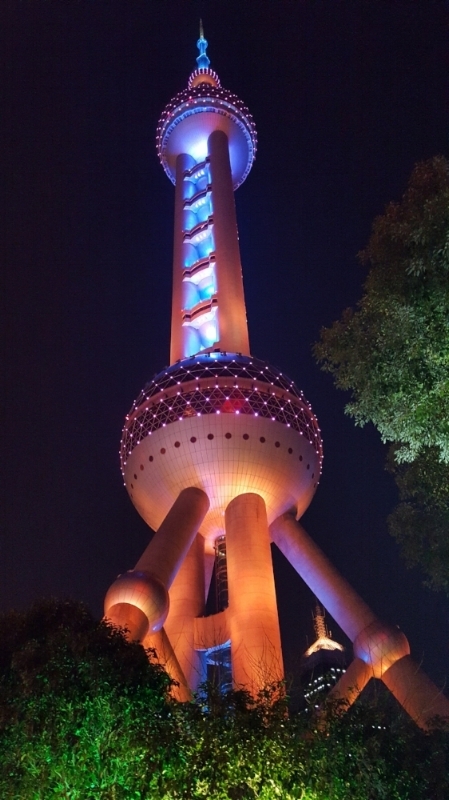 We didn't just look at the pretty towers, we indeed made our way over to the financial district to ascend the Oriental Pearl TV Tower. It's the one that looks like something out of the Jetson's. 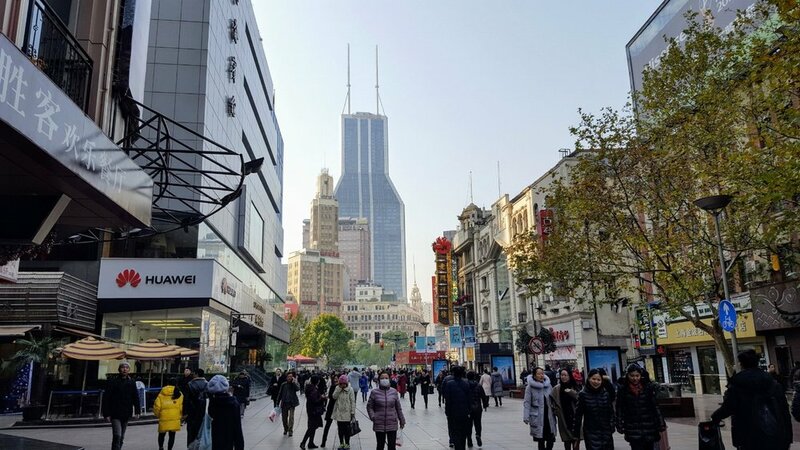 Construction on the Oriental Pearl was completed in 1994, and while it does function as a TV tower, it also offers three viewing platforms, a revolving restaurant, a smattering of cafes and gift shops, and houses the Shanghai History Museum. The main viewing floor is at 263 meters (863 feet) high, and offers a 360° view over Shanghai. Admission to the Shanghai History Museum is included with your admission to the viewing platform (160 Yuan per person, if memory serves; so, roughly 21 EUR or 25 USD), and is well-worth the visit after your elevated sightseeing. You'll wander through several diorama-style rooms—which I personally love in a museum; give me series of good diorama exhibits and I will happily immerse myself in your facts for hours—and learn more about the city in a decidedly not-boring environment. After you've had your fill of the museum, step out of the Oriental Pearl Tower and admire some of its neighbors. Getting hungry after all of this exploration? Me, too. Let's talk about food. Behold the xiao long bao: traditional soup dumplings that are steamed and served in bamboo baskets. They are glorious parcels of intensely savory, salty, porky bliss. One must delicately nibble through the dough and carefully slurp the hot broth in such a way that neither scalds your mouth nor sends the liquid dribbling tragically into the tines of the basket below. By the end of our first basket, I unabashedly considered myself a soup dumping pro. Following the classic pork dumplings, we had a second varietal of xiao long bao, this time filled with hairy crab. Hairy crab is a delicacy in Shanghai and the season for these tasty crustaceans is short; generally from late October into early December. As we were traveling in late December, I cannot speak to the sourcing details of the hairy crab meat in our soup dumplings, but I can confirm that they were one of the best things I've ever eaten. Also, who could say no to this incredible promotional poster? Further culinary delights throughout our stay in Shanghai included phenomenal grilled cheese, twice-cooked pork, wonton soup, noodles in chili oil, and a few rounds of mapo tofu. Note: None of the recommendations below were sponsored in any way. Johan and I independently chose and paid fully for everything we experienced on this trip! We spent four nights at Jinjiang Metropolo Hotel Classiq - Bund Circle and were both extremely pleased. Per my usual method of choosing a hotel, I found this one via Booking.com (that's an affiliate link, btw) and made the selection based on a combination of price, location, and reviews. As the name implies, this hotel is in the Bund Circle area, which means easy walking distance to the Bund, Nanjing Road, and the metro system. The Metropolo Classiq opened in 1934 (historic charm!) and was renovated in 2016 (modern! comfortable!) to great success. The bathroom was particularly fantastic, with what can only be described as a luxury toilet and some of the most majestic, self-confidence-boosting lighting I've encountered. The bed was comfortably firm, the room itself plenty spacious, and breakfast was a generous spread of assorted hot and cold offerings each morning. I would absolutely stay here again and happily recommend this hotel. Shanghai Grandmother Restaurant, 70 Fuzhou Rd, WaiTan, Huangpu Qu. Hotel reception told us about this restaurant and we liked it so much we went back for a second visit after eating lunch there on our first day. Shanghai Grandmother has been around for a long time, serving traditional Shanghainese dishes and known especially for their braised pork belly. Regrettably, we failed to try this dish as the serving is an enormous mound of glossy, quivering cubes of pork and we knew we wouldn't be able to finish the pile, but we saw numerous plates of it leaving the kitchen and have remarked several times that we should have just ordered it anyway. Do try the mapo tofu and the twice-cooked pork! Lao Sheng Chang Dumpling, 337 Fujian Middle Rd, Nanjing Lu, Huangpu Qu. There are hundreds (thousands?) of places around Shanghai serving xiao long bao and assorted dumplings, so I'm not going to pretend that this little restaurant on a side street off Nanjing Road is the best in the city—it probably isn't. But we had such delicious pork and hairy crab soup dumplings that, again, we ate here twice. It's inexpensive, relatively quick, and I've not stopped thinking about my first slurp of pork broth from this place since I left China, so take that for what you will. The Hop Project/Co. Cheese, 372 Dagu Lu, Jingan Qu. Yes, this is a westernized eatery and no I'm not sorry. It's a fun collaboration between Brewdog and Co. Cheese, serving craft beer and creative grilled cheese sandwiches. The beer is cold (shoutout to Elvis Juice, one of my favorite grapefruit IPAs), the sandwiches are melty and flavorful with an ideal bread-to-fillings ratio, and the atmosphere is one of lively comradery. 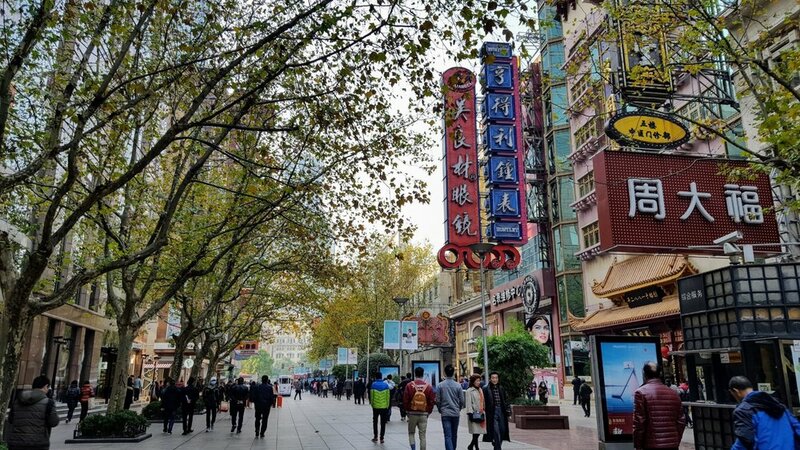 This appeared to be a popular hangout for expats of all ages, and the street of Dagu Lu is home to a variety of cafes and bars. A good evening spot for sure. Goodfellas, 7 Yan'an Dong Lu, WaiTan, Huangpu Qu. A fabulous Italian restaurant recommended by a friend who has traveled to Shanghai many times, Goodfellas did not disappoint. I had perhaps the best lasagna I've ever eaten anywhere, and everything about the experience from the service to the food was outstanding. Highly recommend. Have dinner here, then go upstairs for drinks on their rooftop bar, The Fellas. We spent our last evening here and it was a fitting finale. The Fellas, 7/F, 7 Yan'an Dong Lu. See above. Rooftop bar with excellent drinks and views over the Bund. Char Bar at Hotel Indigo, 585 Zhongshan Dong Er Rd. Admire 30th-floor views over the river while sipping an absurdly clean, crisp Vesper. Thank me later. Niche Bar at Westin Bund Center, 88 Henan Central Rd. The Bund Center is the lovely building that looks like an opened flower at the top, and within its impressive Westin Hotel is Niche Bar. There are no views here, but there's a solid happy hour, a nice lounge-y atmosphere, and they serve a snack mix with dehydrated chilies that were so delightful we still talk about them six months later. This is a great spot to relax during that mid-to-late afternoon period when you're trying to figure out what to do with your evening and need a sit and a sip to clear your head. The Jazz Bar at Fairmont Peace Hotel, 20 Nanjing Rd. East. Slink in here after 9 PM for atmospheric old jazz from the 20s and 30s. The average age of the current band is 82, so these guys have been doing their thing for decades and have the fan following to prove it. Enjoy a cocktail from the menu inspired by the same glamorous days of yore while you're listening, and it's easy to feel like you've actually stepped back in time. • Be aware that showing up with your foreign mobile phone with its foreign SIM card will render you unable to access Google and most forms of social media. Wi-Fi is accessible enough, but heavy internet restrictions will still leave you without the maps and communication methods to which you're likely accustomed. While it's possible to buy a local SIM card for use with an unlocked phone, I didn't find the matter pressing enough to bother with. It was actually kind of refreshing to be out of touch for a few days, so unless your stay within mainland China is going to exceed your personal or professional limitations on connectivity, I say just embrace it and be present in the moment. • You'll get used to navigating by structures. With Shanghai's many tall, recognizable buildings, you'll find yourself making your way via landmark in lieu of a map. It's a little confusing at first, but then it becomes a fun quest each time you wish to find your hotel again and you're reminded that it is indeed possible to trust in your own directional competency. • Beware of the "tea house" scam. On our first day, sleepy and not yet having grasped our bearings, Johan and I were approached at a busy intersection by a young woman who looked to be about our age. She asked us to take a photo of her and then started chatting enthusiastically, asking where we were from and making small talk by relating to our mention of Stockholm. She continued on, asking where else we've been in China, have we been to Beijing, telling us how we should definitely visit Beijing someday for all the history and culture, eventually pausing long enough to ask us if we like tea. She said she was on her way to meet some friends for a traditional Chinese tea ceremony and invited us to join. We were both hesitant due to our aforementioned drowsiness and had been walking back to our hotel to take a nap when she interrupted us. She was very insistent, saying it would be a lot of fun and we could meet some local friends, how often would we find an opportunity like this, etc. J and I did a lot of that back-and-forth, "what do you think?" thing that couples do sometimes when both people are hoping the other makes a decision because neither of you wants to be the lame, un-fun one. Due to her overly familiar conversational style and increasing pushiness with the tea ceremony invite, I was feeling uneasy and had begun discretely patting my coat pocket to make sure my phone was still there and that this wasn't one of those situations where one person distracts as another pickpockets. Eventually we agreed that no, now was not a good time to go drink tea with strangers so we declined and continued walking. I looked back after we'd crossed the street and noticed the girl had not continued on anywhere, but had instead started chatting with someone else. Discussing it as we walked to the hotel, J and I had both found it strange that this girl had wanted her photo taken at an unremarkable intersection and was then so insistent that we join her for tea. I searched "shanghai scams" when we got back to the room and almost immediately found multiple accounts of this exact scenario. Apparently when people agree to attend this tea ceremony, they're led on a convoluted route to a hard-to-find tea house, are distracted with introductions to new people and being asked many questions, are served numerous tea samples as per "tradition," are then encouraged to pick their favorite to take home, and at the end are presented with an outlandish bill. There are many stories of tourists being scammed out of hundreds worth of AUD/USD/EUR/GBP, and there's little option for recourse after the fact. • Getting around the city is quite manageable thanks to the metro and reasonably priced taxis. Credit cards are widely accepted, but do be sure to keep some cash on hand for taxis, street food, small eateries unlikely to accept cards, etc. ATMs are prevalent. • Useful info for getting between the city and Pudong Airport can be found here. • Travelers from many countries are eligible for 144 hours of visa-free transit through a handful of Chinese cities, including Shanghai. To this end, be sure to research current regulations as you plan your trip to ensure accurate, up-to-date information. I also highly recommend bringing printed copies of all flight and accommodation confirmations with you as it will make your life much easier if there's any question as to your eligibility for visa-free transit, as well as expedite your experience in the customs line upon arrival to Pudong Airport. You'll need to prove that you are, in fact, departing the country within six days and it is helpful to have your onward flight details at hand and be able to prove the address of where you're staying during your time in Shanghai. Do not just save PDFs to your phone and count on displaying digital documents; print them out, put everything in a plastic sleeve or folder, and enjoy the fruits of your thoughtful preparation. Have I missed anything...? Shanghai is a wonderful city that I've thought of frequently since my visit and I look forward to returning to discover much more (and to eat countless baskets of xiao long bao, of course). If you have any questions about my Shanghai experience that I haven't touched on here, feel free to ask!